Irrespective of the style that you practice to learn Muay Thai, you should have a partner. Practicing this sport with another person allows you to improve the required skills. Similarly, when you practice Muay Thai with a partner, you should learn to develop skills for timing, distance, along with accuracy. Apart from training with the partner, you should not overlook practicing martial arts with yourself. This article will teach you Muay Thai, the national sport of Thailand. These activities performed in Muay Thai sport will help you to learn it. These tips and techniques are suggested by the trainers during camps. Muay Thai is the national sport of Thailand, which is a form of martial arts practiced in many parts of the world. This sport is very famous in the south Asian countries and is also referred by the name of “The Art of the Eight Limbs”. Player of this art excels in using the eight limbs: knees, elbows, hands and shins for striking the opponent. Muay Thai is not just a form of sport, but it is the very effective self-defensive art too. For learning this art, for getting trained, one doesn’t need to be in shape. This sport is based on skills. All you need to do is to focus on techniques and do the training with patience. Initially, things will be little difficult, but constant practice, patience, and focus will make the way smoother. In the beginning, things may be little tight, and to cope with it, you may need to give some extra time in it. There are many camps and gyms available worldwide for this art. Some camps are specially built only to teach Muay Thai. In this training, one uses their limbs to attack the opponent, and hence increases the overall strength of body. It is believed that a regular practitioner of Muay Thai has a better leg and core strength. Also, they have better mobility from hip areas and are less stressed. So in all, learning this art can improve health too. Coming to the self-defense mechanism, then Muay Thai is not very strong art, and one can learn it on online too. There are many youtube videos for that. Women, weak people can use this as a defence mechanism for themselves as it involves mostly limb movements. So, in all, Muay Thai is an overall very beneficial activity which can improve out lifestyle to a great extent. Have you heard about the art of eight limbs? That’s just a nickname for Muay Thai or Thai boxing as people call this incredible sport and martial art. The name is self-explanatory – Muay Thai relies on the eight limbs of our body – the knees, the feet, the elbows and the fists/hands. For many people, Muay Thai is nothing else than an attractive combat sport that they love watching. But, there is another thing that made this old sport from Thailand popular around the globe. More than a decade ago, many people have witnessed the emergence of the so-called fitness craze and most of them have started exploring the different fitness options that they have. The poor lifestyle choices have affected the health of almost every adult man and woman. Today, these health issues are present even more – obesity, overweight, diabetes, cancer etc. People have figured out that in order to stay healthy they will need to take physical activity more seriously. So, they’ve started looking for a fun, dynamic sport that can provide quick results. This is where Muay Thai comes into play. If you want to create more free time for exercising and you want to enjoy this activity, it is the best option to use your next holiday in Thailand where you can join a Muay Thai training camp. Thailand is one of the best holiday options available to people today. On the other hand, these Muay Thai training camps have special programs for tourists looking to experience the benefits of this sport in a short period of time. After two hours of intense training, you should start feeling better. Of course, these positive effects will increase after every day spent in the camp. Muay Thai training is beneficial for literally every aspect of your health. From well-toned body and better cardiovascular system to better mood and stress elimination – Muay Thai is here to help modern men and women boost their health fast. In addition, this sport will give you a chance to start a new fitness routine that you can practice at home. Muay Thai is a combat sport of Thailand that uses stand-up striking along with several clinching techniques. This bodily and psychological discipline which includes combat on shins is known as “the art of eight limbs” as it is categorized by the combined use of fists, elbows, knees, shins, being related to a good physical grounding that makes a full-contact fighter very proficient. These are the 4 things you should prepare while training in Thailand. When defining the Muay Thai camp in which you want to train at, the first thing you have to consider the type of experience you would like to have and your current level of experience. There are two camps, one is the authentic/local public and the other are geared towards foreigners. Training in Muay Thai in Thailand is a bit not easy so prepare yourself for the most exhausting, grueling, and painful, yet worthwhile, pleasurable, and memorable experience. A normal day training will consist of a morning and afternoon run, two sessions that last between two-three hours each and the fighters will commonly train five to six days a week. Thailand accommodations can be as reasonable or as lavish as you want it to be depending upon what you can afford. It is highly recommended to stay in the camp’s dormitory. In the morning you are woken up with music ringing out from the camp and the shrill crack of shins on Thai pads. Delicious street food is everywhere and tremendously affordable, and completely safe as Thai food is so delicious that it is almost impossible to spend your entire day trying various cuisines. Supply your body with the electrolytes it needs. If you are just like most other people, then you probably lack time to pay attention to your physical condition and even to your health in general. This is not a surprise given the fact that modern men and women work a lot more than before and on top of that they need to take care of their family and the household. Sure, this is not something wrong, but we also must find time to work on ourselves both physically and emotionally in order to prevent the development of diseases and to keep our mind clear. One of the simplest methods to achieve that is to add physical activities during your holiday. This might not sound like the most exciting suggestion, but the truth is that fitness activities can be found, but only if you choose the right one. One fitness activity that is interesting and exciting and activity that can provide a fast result is Muay Thai. Muay Thai, commonly known as Thai boxing, is a popular and trending fitness activity, combat sport and martial art. 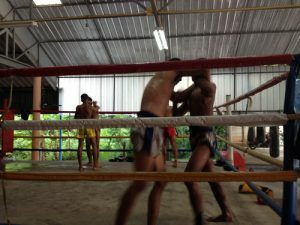 Even though you can find classes dedicated to this sport in almost every popular gym, the best thing that you can do is to travel to the country where this sport was invented and the country where Muay Thai has a status of national sport – Thailand. Thai people are very passionate about this sport because throughout history it has helped them prevent their land and professional fighters today are true stars which possess some incredible fighting skills. Of course, we are not talking about becoming a professional (which is also an option), we only suggest practicing Muay Thai in Thailand as a recreational activity. In this way you will shape your body, improve your physical and mental health and learn how to protect yourself. In addition, you will also relieve the stress that accumulates throughout your body over the year. If you want to experience all these things and even more you must join a professional training camp like Suwit Muay Thai. This gym has helped dozens of students from every part of the world to achieve their fitness goals. They have professional instructors, top notch equipment, clean facilities and accommodation. Suwit Muay Thai provides family friendly environment and the same goes for Phuket Island where this camp is located.